Washington state lawmakers are once again considering bills to exempt Washington state from Daylight Saving Time. Here's why one sponsor thinks the effort will succeed this time. Shifting the clock back and forth twice a year is bad for people, says Washington state Sen. Jim Honeyford. It has negative effects on public health, traffic, schoolwork and crime, he says. “Even the cows don’t like it,” he said in a recent telephone interview. The Republican from Sunnyside has introduced bills to exempt Washington state from the twice-yearly shift between standard and daylight time twice before, but he thinks the third time could be the charm. This year, he said, the bills he introduced with two Democratic senators, Senate Bill 5139 and Senate Bill 5140, enjoy wide bipartisan support. They’re also being watched by counterparts in Oregon, California and some counties in Idaho. All of that makes for better odds, Honeyford said. The proposed change would need approval at the federal level, he said. The U.S. Department of Transportation would examine potential effects on commerce, and Congress would have to amend the Uniform Time Act to allow states to choose whether they want to observe Daylight Saving Time. “If the West Coast doesn’t have a unified front, we have no chance,” Honeyford said. If these bills pass, Washington state would join a few others trying to get off the semiannual see-saw. Florida passed the Sunshine Protection Act last year. California voters approved an initiative on the matter in November that now awaits approval from state lawmakers and Congress. A similar bill will be before the Tennessee Legislature this session, and Honeyford said he expects Oregon state Sen. Kim Thatcher, R-Keizer, to introduce a bill similar to one she proposed in 2015. Bills to do away with Daylight Saving Time have previously been considered by Idaho, Montana, Nevada, Wyoming, Colorado, New Mexico and Utah. As it stands, Arizona and Hawaii are the only two states that don’t observe Daylight Saving Time. The territories of American Samoa, Guam, the Northern Mariana Islands, Puerto Rico and the U.S. Virgin Islands don’t, either. Honeyford said the issue is a perennial one with him because his constituents want it. Residents of Canada’s Port Arthur, Ontario, now known as Thunder Bay, first implemented Daylight Saving Time in 1908, according to Time and Date AS. The first entire nation to do so was Germany in 1916; it was an attempt to save energy during World War I, according to The Peninsula Daily News. The U.S. briefly adopted Daylight Saving Time from 1918 to 1919, then reinstated it for good during World War II. However, from 1945 to 1966, individual localities could choose whether to make the switch, creating a muddle for railroads, airlines, bus companies and others. The Uniform Time Act of 1966 established a system of uniform daylight saving time within time zones throughout the U.S. 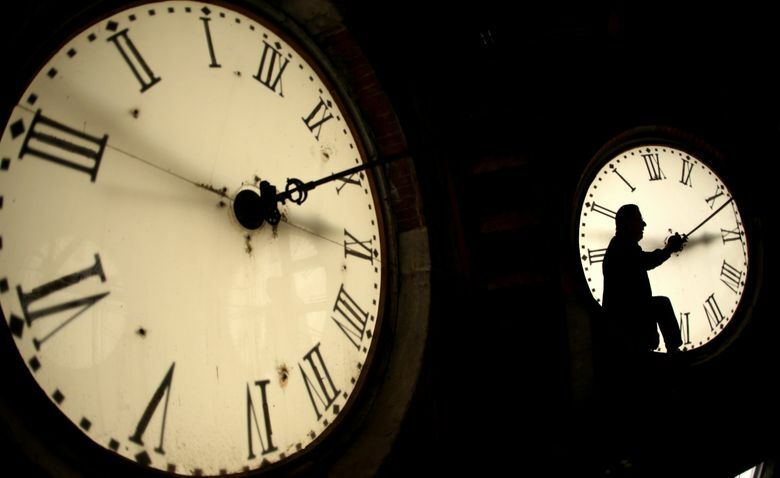 It exempted states that opted to remain fully on standard time, the Daily News reported. Honeyford said the switch was advertised in the 1940s and ’50s as being good for farmers, but he said he represents farmers and has been a farmer himself. “The truth is farmers get up at light to work and go to bed when it’s dark, and what I’ve heard is that the cows don’t like it either,” he said. Honeyford said he doesn’t much care whether Washington state observes Pacific Standard Time — which is what we’re in now — or Pacific Daylight Time, as long as we pick one and stick to it. “I don’t care which one it is as long as we’re not switching back and forth,” he said.